The following post is a guest review from a good buddy, Russell Radel. Craft beer is as much about the fellowship and community as it is the beer. I welcome multiple perspectives and contributions to this blog. If you would like to share your thoughts, reviews or opinions on a beer, brewery, or bar, simply contact me or leave a comment below. Cheers! As a Christmas gift I got a free growler fill at Community Tap (@communitytap) in Greenville, SC. I was excited to get something new to me from my home state to see what I had been missing in my time in Jacksonville (4 years strong!). 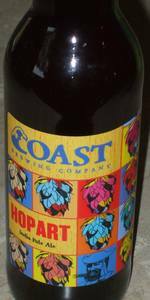 An exciting brewery, Coast Brewing (@coastbrewing) from the Charleston area had an offering called HopArt IPA, a 7.7 ABV beer that by the look of the label and description from the brewer promised to be an assertively balanced brew. Sign me up! So I dove in, a gallon growler to explore, one persistent man to explore it. First glass: "Thank goodness it is as advertised!" Drank it fast, can't even tell its 7.7!! Second glass: the brew really opens as it hits optimum temp. both in the (light for an IPA) nose and the sweet yet fresh hoppy flavor.